It all started with 11 secondhand chickens that friends packed into plastic bins and drove to our house. Those original 11 birds reproduced themselves, and the widescale slaughter we’d expected at the hands of predators or disease has yet to occur. At the moment, my family shares our property with 23 chickens and seven ducks; another three ducklings arrive later this month. -It seemed like a good idea at the time. Whatever the reason, once we’d invested in the birds, coops, feed, and fencing, we felt a certain responsibility to keep them alive. Our dog did not share this sense of responsibility. Our dog wanted to do what came naturally: Snack! One of the challenges of living with multiple species is navigating the fine line between the freedom of one species and the survival of another. After a few close calls, during which my daughters shrieked hysterically while I sprinted across the lawn to rescue an unlucky chicken or duck from our dog’s jaws, we decided that we’d have to restrict the dog’s freedom in order to insure the poultry’s survival. We kept the dog in the house and walked her twice a day on a leash. Everyone seemed happy enough with the arrangement, which included the added benefit of daily exercise for my husband and me. Hermes the cat is the offspring of a barn cat mother and an unknown father, so we expected that he might have feral tendencies. The original plan had been for him to be an outdoor cat, since two members of our (human) family have confirmed cat allergies. However, we decided to keep him inside during his first year of life while he acquired the necessary vaccinations, operations, and girth to survive outdoors. Hermes is now seven months old, and has lived inside his whole life. Despite the occasional nose swat, cat and dog coexist peacefully. The human allergies haven’t flared as badly as we feared. Over time, the goal of transitioning Hermes to an outdoor cat has become increasingly fuzzy. “We’ll let him choose, when the time comes,” we started saying. Hermes decided that the time had come last week, and he chose the outdoors. The way Hermes chose the outdoors was to sneak into the mudroom and skulk around until somebody opened the outside door. Then he’d dash out, followed by multiple shrieking girls. This was not an isolated incident; Hermes only became more determined with each escape. At one point, he ran outside three times in a single afternoon. These were not quick forays followed by a shocked, regretful cat returning to the safety of the house; every time Hermes escaped, he became more difficult to catch, hiding under cars and darting further into the yard. Our dog never rebelled against being mostly confined to the house; she embraced the chance to rest on the couch in her middle age. Hermes was clearly of another mind as he sat at the door, mewing pitifully. I know indoor cats live longer, as do the birds in their yards. And yet, what to do with an animal who was so clearly unhappy with a life within walls? We were prepared to buy a flea and tick collar and let Hermes begin his outdoor adventures early – until he escaped while the chickens were grazing right outside the front door. As had happened with the dog, instinct kicked in and Hermes gave chase. He was unsuccessful: The chickens were unhurt, but traumatized. A few days later, I ran into my friend June (names have been changed.) June and her husband, Tom, keep a small flock of laying hens; they also have an outdoor cat, Fluffy, who is a cold-blooded killer. Often, when I go to pick my kids up from June and Tom’s house, I have to weave my way in between the carcasses of various small animals lining their walkway. “Does Fluffy chase your chickens?” I asked June. When I repeated this conversation at our dinner table, our family split immediately into two camps: Those who sided with the cat, and those who sided with the chickens. 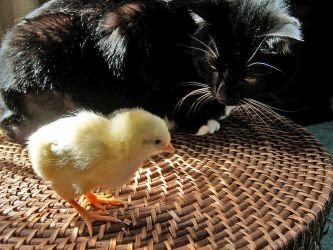 My husband was in favor of a “survival of the fittest” approach: Sure, we might lose some of the slower chickens, but the rest would probably figure out how to outrun the cat. “Whack the cat! Whack the cat!” chanted one of my chicken-loving daughters. “Maybe we could ask Tom to come over here and whack the cat for us….” ventured a practical daughter. At press time, Hermes was still an indoor cat; no poultry was killed and no cats were whacked during the writing of this column. But I notice that our dilemma over the freedom versus survival of our various animals is replicated in our human family. For instance: One daughter has a friend over, and her sisters also want to play with said friend. Do we ban all siblings from disturbing the playdate, or require daughter-and-friend to be inclusive? Or: I want to shower, read, and talk to my husband after our children are in bed. Do I choose these things knowing that I’ll stay up too late as a result, or skip them for a decent bedtime? So, I have a bone to pick with our founding fathers: Although I agree that life, liberty, and the pursuit of happiness should be inalienable rights, whether you're human or animal, I’m not sure that it’s possible to possess all three simultaneously.